My recent memories of Ciudad Juárez were bleak. The last time I went was in 2009 — and only out of necessity. At that point, the city was approaching the peak of its drug violence. More than 10,000 people were killed between 2008 and 2012. It became a ghost town — only leave your house if necessary. However, as a native El Pasoan, I also had fond memories of the “old” Juárez — a city that was vibrant and full of life. My family would cross el Puente de las Americas, or Bridge of the Americas, once every couple of weeks. We’d go there for groceries, haircuts, dental appointments and, frankly, for the atmosphere. My parents, who were both born and raised in Mexico, missed their culture and their people. When I crossed into Juárez last week to report on Pope Francis’ historic visit, I was instantly reminded of the “old” Juárez. The streets were buzzing once again. The kind people of Juárez re-emerged, unfettered by fear. The city is by no means perfect, nor is it 100 percent back to where it once was. But on the day the pope arrived and drove through the city, it felt like everything was OK.
Tens of thousands of people donning white Pope Francis shirts created a “human chain” to guide him through the city. That “chain” was once shattered, when the city was in chaos. Hand in hand, the people of Ciudad Juárez were ushering in a new era of hope. 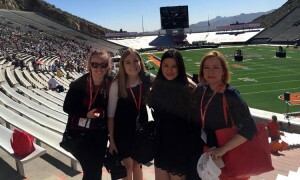 The opportunity to travel to El Paso and Ciudad Juárez during Pope Francis’ visit was a once-in-a-lifetime experience, especially as a college student just starting out in journalism. As an Arizonan who has only seen the U.S.-Mexico border within the state, it was interesting to see the relationship between the two countries in Texas. There are a lot of different perceptions that people have about Ciudad Juárez, Mexico and unfortunately most of those perceptions are negative due to the reputation the city had a few years back. This trip reaffirmed the fact for me that on-the-ground borderlands coverage is important, especially in areas where a lot of change is happening. There is the general relationship between the two countries, but at each border crossing there is a different atmosphere, different issues and different stories to be told. Our visit came at crucial point that could possibly mean change for the atmosphere around El Paso and Juárez. Some of those across the United States who responded to a Public Insight Network query on what Francis’ visit meant for the border said they were hopeful that Francis’ visit could bring change to the region, which has faced perceptions of being very violent. “I hope that Francis’ visit softens the folks in border states, of which I am living, to a better understanding and acceptance of the Mexican peoples,” said California resident Sharon Smith in response to the query. 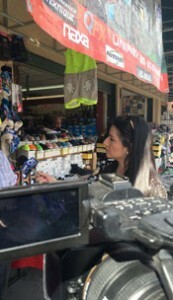 For me, visiting this area during Pope Francis’ first U.S.-Mexico border visit was something that really shed a light on the diverse stories that need to be told in the area and across the rest of the border. As a college journalist, covering this event on the ground taught me a lot. Journalism is a hands-on profession, and being able to be there was an important learning experience. It may seem like the viewpoint of a Chileno-Fronterizo is almost too niche to count, but you’d be surprised at how many Chileans decide to call the borderlands their home. Like my family, many come from desert regions similar to the Southwest, and transfer to jobs like astronomy or mining, which are popular in both places. Both have a high concentration of Catholics, as well. 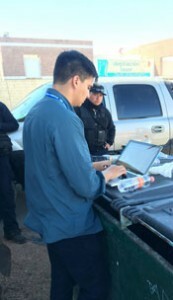 So when our team went to the U.S.-Mexico border to cover Pope Francis’ visit, I couldn’t help but make connections. Everything from the relaxed dining atmosphere to the vibrant markets and plazas to the relative hospitality of strangers and friends-of-friends reminded me of my life back in Chile. I only rarely felt suspicious of my surroundings or the people I saw, which I attribute to remnants of the fear of Ciudad Juárez instilled in me through the years. It may have been the goodwill of Francis’ visit that brought this out of everyone on an enhanced level, but still, you don’t see the type of kindness I saw on our trip much in the United States. As I interviewed people in the streets, about 1 in 3 would ask me where I was from. I guess they knew I wasn’t Mexican or American, my rushed and slurred Chilean accent still present. It was a pleasant question to get, to remind me that Latino presence around the border can come in so many different ways. That anyone, even a Chileno-Fronterizo, contributes to making the borderlands the complex place it is. Coming from Denver, Colorado — far from any national border — I’d always come from a background where the ideas of Mexico and the border were both steeped more in myth than reality. And that myth was one of fear and danger. Nowhere in Mexico feels the consequences of the myth more than Ciudad Juárez, which is infamous for the cartel violence that shook the city several years ago. Despite my experiences visiting Nogales, Mexico, and traveling across Central America, I still felt a small twinge of anxiety at the back of my mind thinking about visiting Juárez. What many of us heard in our reporting was hope that Pope Francis’ visit could help liberate the region from that myth. Of the many across the U.S. who responded to a Public Insight Network query on what Francis’ visit meant for the border, several emphasized ending the violence that has been the picture of Juárez for so many, for so long. Over the phone, Martin said she hoped that one day, El Paso and Juárez would be able to return to the relationship they once had, where the two cities worked together to crack down on crime and children crossed the border in groups just to go to school. For me, the most impactful moments of my visit were those where the desire to revitalize that relationship was clear in both cities. Sitting in the University of Texas at El Paso Sun Bowl, reading the words “We Are With You Juárez” on the electronic screens visible to everyone in the stadium, brought me to tears. For me, covering this historical event in El Paso and Ciudad Juárez brought back memories of the day my family and I crossed the border, risking everything to reach the United States, otherwise known as America. For us it was the land of opportunity, where anything was possible. Seeing the ports of entry and the fences that divide Mexico and the United States brought back the vivid memory of that cold and rainy night when we walked through the desert hoping to one day reach el sueño Americano — the American dream. That’s exactly what this trip to the border meant to me. 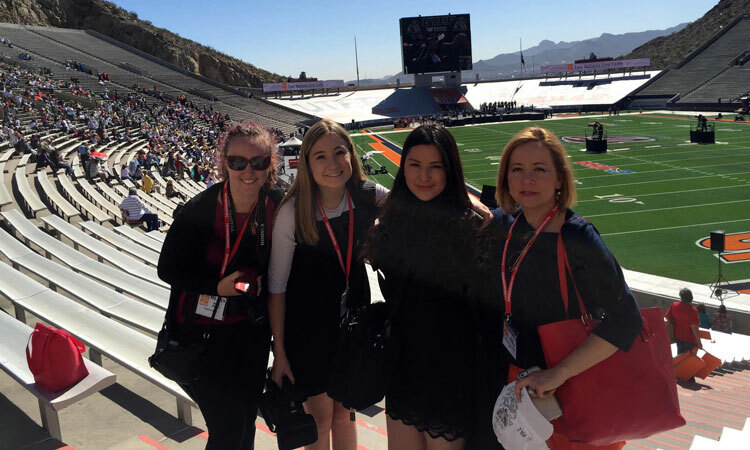 It meant that being there, as a bilingual Cronkite news reporter, my “American dream” is slowly becoming a reality. Being able to hear and tell the stories of immigrants who, like me, came to this country in search of a better life was an unforgettable experience and a highlight in my journalism career. Through my bilingual skills, I was able to connect with immigrants on a deeper level. Additionally, I was able to fully understand and tell their stories more authentically. 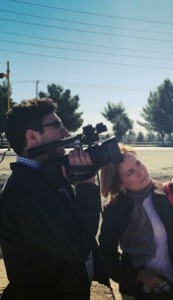 More importantly, through this experience, I came to realize the need for more bilingual journalists like me to tell border stories that too often are ignored.